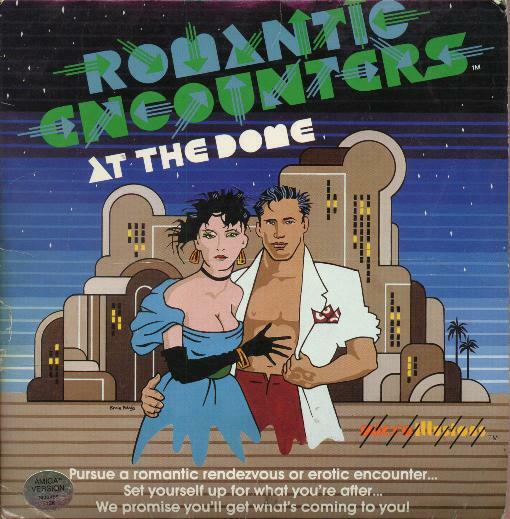 An adult text adventure set in singles' club, with scenarios for both male and female players. Sessions are short, and interaction is geared toward NPC's and surroundings, no object-gathering or puzzle-solving. Thus, the parser can afford to be more flexible than standard adventure games, allowing the player to type something like: "SHE SEEMS NICE, BUT I'LL LOOK AROUND FOR SOMEONE ELSE." Still, it picks out key words, so it's fairly easy to trip up. The game comes in a square folder/pouch, open along the right side.